Ekaterina Kudashkina: This week we will start by discussing the validity of the idea to bring Libyan leader Colonel Gaddafi to court for alleged war crimes and crimes against humanity; then we will talk about the latest in U.S.-Russia relations, including Vice President Joseph Biden’s visit to Moscow; and finally we will highlight Marine Le Pen, who has suddenly appeared as a new French political star. Now we turn to Libya in our Beyond The Headlines section. Can Libya leader Colonel Gaddafi one day become an easy catch for International Criminal Court? Similar statements denouncing violence in Libya and calling for the international community to interfere were made by Russian President Dmitry Medvedev and other world leaders. And on Feb. 26, the United Nations Security Council in a rare unanimous move passed Resolution 1970, referring the situation in Libya to the International Criminal Court. The preamble to the resolution notes: "The widespread and systematic attacks currently taking place in the Libyan Arab Jamahiriya against the civilian population may amount to crimes against humanity." Mira Salganik: It was reported that the ICC should complete its investigation by May 4 and report to the UN Security Council. 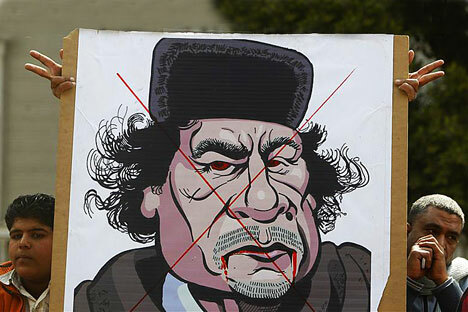 Ekaterina Kudashkina: This is unpleasant news for Colonel Gaddafi. Now the crimes committed by his regime are going to be referred to the ICC, regardless of the outcome of the conflict. Experts note that this is only the second time that the Security Council has used its discretion under the ICC's Rome Statute to refer a matter to the court. The first referral, under Resolution 1593 of 2005, was made in respect of the situation in Darfur, which led to an arrest warrant for Sudanese President Omar al-Bashir for war crimes, crimes against humanity and genocide. Sergei Strokan: Yes, but with this latest UN resolution, the idea of “justice without borders” for Libya is finally shaping up, and all the eyes will be focused on ICC. The court will have to investigate, formulate and prove all charges relating to the ongoing violence and to underscore its widespread and systematic nature, in fact those are the distinguishing features of crimes against humanity. Ekaterina Kudashkina: The performance of the International Criminal Tribunal for the former Yugoslavia revealed all the limitations of “justice without borders.” The questions of crime and punishment became subject to some sort of behind-the-scene bargaining. Regrettably, the universal law principles were applied highly selectively. It grossly undermined the court’s credibility. Sergei Strokan: Today our eyes are focused on Libya, and I believe the justice without borders will not fall into the same trap in the case of this country. While the UN Security Council resolution refers to attacks "against civilians," I believe there is nothing to stop the court from investigating alleged atrocities committed by anti-government forces. Fair is fair, they have to investigate how both sides acted. Ekaterina Kudashkina: Another question is what would happen to foreign mercenaries fighting in Libya. The UN resolution on Libya contains a rather confusing provision that excludes "nationals, current or former officials or personnel" of states other than Libya from the court's jurisdiction. This point was included in the resolution at the insistence of the United States, which doesn’t want to create a precedent paving the way for making US citizens accountable in other countries. Sergei Strokan: I think that the International Criminal Court for Libya faces an uphill battle that has to be bravely fought to indict those accountable for Libyan atrocities both politically and morally. Ekaterina Kudashkina: I wish I could say that these courts are totally free from all political influence, but I am not an expert, so now we are joined by Ivan Zvonimir Čičak, Chairman of the Croatian Committee for Human Rights. Ivan Zvonimir Čičak: It is very difficult to understand the real influence of the politics at those bodies like the international ad hoc tribunal for the former Yugoslavia, the international Permanent Court, and what the real role of the justice is. Of course it is legitimate for everybody to lobby and have influence, but not too much; sometimes it is necessary to leave the judiciary system to work alone. For example, it is very difficult to understand the role of Russia, the United States, Germany or England at the ad hoc tribunal for the former Yugoslavia. The perception in the former Yugoslavia is that this court is an instrument of powerful countries and important people and it is riddled with influence and conspiracies. Ekaterina Kudashkina: But how efficient has the court been? Ivan Zvonimir Čičak: It was very efficient. The fact that Milosevic died in prison was enough for the whole court, in my mind. An even bigger result is that they sent a significant signal to that there is no amnesty for big personalities in political life. We also have the permanent court for crimes, the International Criminal Court. The recent decision of the United Nations that the permanent court could investigate the case of Gaddafi is very important because it means the UN recognizes this court. But now I am waiting for the ratification of the court in your parliament, in the parliament of the United States, China, India. You should know that there are about 140 countries in the process of the recognizing the court. Ekaterina Kudashkina: Who decides who can be brought before the court? Ivan Zvonimir Čičak: Unfortunately it is of course the role of the big powers who decided that nothing can be out of the auspices of this court. The problems will occur when this court will be accepted as part of the judicial system in Russia or in the United States. When will this court be the instrument of the United Nations and not of the big political forces? Ekaterina Kudashkina: But if we remember history, there was no issue of recognizing or not recognizing the decisions of the Nuremberg court after World War II. Ivan Zvonimir Čičak: The Nuremberg court was recognized only for the countries that lost the war. In the case of Yugoslavia, it was the court for everybody. It was a new step. For Rwanda, unfortunately, it was the court only for the Hutus, not for the Tutsis. And that is why they kicked out from the game Carla del Ponte who for me was a perfect prosecutor. Ekaterina Kudashkina: It is interesting that you mentioned the case of Carla del Ponte. And I am not sure all our listeners know about that. Could you tell them more about that? Ekaterina Kudashkina: It is right that if a person is accountable, if he is guilty of putting to death large numbers of people, he is eligible to be brought before this court? Is that correct? We have talked about Milosevic, Gaddafi, but what about George W. Bush, who started the war in Iraq without sufficient evidence? Ivan Zvonimir Čičak: It is not the same thing. It was very important to kick out one of the bloodiest dictators, Saddam Hussein. I am ready to forgive everything in that bloody war, which I didn’t like very much, and I am not supporting very much George Bush in this action, but you know, Saddam Hussein was a very awful person, Milosevic, even he was. You know, even for myself sometimes it is a big question as to how it was possible to intervene in Bosnia or in Kosovo; it is a big question for all of us about what is happening in Libya now. It is absolutely clear for everyone that the Libyan leader is a bloody creature. So what to do – to abolish the Libyan chief and let him do what he wants, or to intervene for the humanitarian reasons? Ekaterina Kudashkina: My point is that there might be all kinds of noble causes, but we need to act within legal limits. Ivan Zvonimir Čičak: I agree with you, and that is why it is necessary that Russia and the United States and China and India recognize the Permanent Court for war crimes. Sergei Strokan: I think that the main message of Mr. Cicak was that all world powers has to give green light to the International Criminal Court and to extend full cooperation to it. I hope you will agree with this message? Ekaterina Kudashkina: But we should define who are eligible, because for me democracy is equal rights for everybody regardless of their beliefs, positions. If we treat two different people for the same crimes differently is not democracy for me. Sergei Strokan: I am not advocating this. What I am saying is that the International Criminal Court for Libya has to investigate all the details of both sides acting in the conflict. Ekaterina Kudashkina: I suggest that we move on to a lighter subject – the visit of U.S. Vice President Joseph Biden to Russia. We are moving to our second heading – Between The Lines – in which we usually discuss what we see as one of the most notable publications of the week. This time I suggest a piece written by Ellen Barry for The New York Times. The story is entitled “Georgia Poses Hurdle for U.S.-Russia Ties” and it was published on March 7, right before Biden arrived in Russia. Sergei Strokan: It’s strange that Barry would focus on Georgia and its position on Russia’s accession to the WTO, though. Ekaterina Kudashkina: Not really. The issue was on the agenda of Biden’s two-day stay in Moscow, and those discussions coincided with a new round of talks between Russia and Georgia in Bern, Switzerland, also focusing on Moscow's bid to join the World Trade Organization. Although I believe Barry tends to overestimate Georgia’s role in the issue. Mira Salganik: So do I. Anyway, the talks have been resumed, which is a good thing, in any case. Sergei Strokan: But let me explain, Georgia’s negotiators have asked for a role in customs administration on borders with what they call the separatist territories, Abkhazia and South Ossetia, and Russia. But of course for us here in Russia, those are not separate territories, they are already independent states. According to the Russian position, taking into consideration that they are independent states, Georgia has no right to make such claims. Mira Salganik: And as far as we know, Mr. Biden supported Russia’s admission, didn’t he? Sergei Strokan: He most certainly did. Speaking on Wednesday after meeting with Russian President Dmitry Medvedev, Joe Biden said that Russia's membership in the World Trade Organization was a top priority for the United States. Biden also said the United States hoped to cancel a trade restriction provision, obviously referring to Jackson-Vanik Amendment, which restricts trade with the Soviet Union, and was adopted by the U.S. Congress in 1974 to pressure the Soviet Union into allowing Jewish emigration. Sergei Strokan: So, to sum up what was said, the most important thing, I suppose is that Biden praised progress in "resetting" bilateral relations despite skeptics' expectations. Ekaterina Kudashkina: I’ve seen more critical remarks. Some analysts are saying that the warm up in relations between Russia and the U.S. is due to the mere fact that the U.S. needs Russia’s help in Afghanistan, in Iran. Stratfor analyst Lauren Goodrich says that although reset is said to have worked out well, deep differences between our countries still remain. Goodrich says that in several years the U.S. might wrap up its focus on the Islamic world and what will happen once Washington decides again to focus on Eurasia? We are now joined by our next guest speaker, Dmitry Trenin, Head of the Carnegie Moscow Center. Mr. Trenin, what were the expectations connected with Biden’s visit to Moscow? Dmitry Trenin: The expectations were that this visit would help steer the relationship towards new objectives; the reset has worked, the reset is over, in my view, it has been a success. Now we have a good working relationship between Washington and Moscow. Now it is time to move forward. This visit is preparing the ground for a new step forward in the U.S.-Russian relations. This can materialize from the next meeting between the two presidents. So the fact that the vice president has come to Russia signifies the importance that the administration attaches to relations with Moscow. It certainly shows that President Obama views this as a very important visit, that it is not just symbolic. I think that American policy towards Russia is maybe becoming strategic, and if it is true it might be good news. Ekaterina Kudashkina: What are your impressions of Mr. Biden’s meeting with Mr. Medvedev? Dmitry Trenin: I think that it was a good meeting; the two are on the same wave, I believe that the personal relationship is good, which is helpful in terms of discussing many important issues that require not just careful preparation and good knowledge of one’s interest and good understanding of the other side’s interests, but also a lot of good will and mutual trust. I think we are starting to get it in U.S.-Russian relations. I will be cautious, I am not going to say that everything is perfect between Washington and Moscow; it is surely isn’t. However clearly the last two years were the time of a very serious and real positive shift in the U.S.-Russian relations. Dmitry Trenin: I think it is wider than that. I believe that the power shift away from the traditional West towards China and other countries in Asia has affected the thinking of American strategy-makers. In this world where China is becoming more powerful, where you have other players, non-Western players, raising their profile, you have a potentially enormous instability in the Middle East, it becomes clear that Russia is too important to ignore, too important to be relocated to the position of an auxiliary. Russia is important in terms of American global foreign policy, this is my view. I cannot say to which extent it is shared by the Obama administration, but I would not be surprised if the people in the administration are not be thinking along at least the similar lines. So Russia is more important that just assisting in transit to Afghanistan. I think it is a much more important and fundamental question. Ekaterina Kudashkina: There is another point that was made by some of the American analysts. There are saying that in some years, the United States will refocus its policy on Eurasia and that former differences are going to emerge between our countries. Do you agree with that? Dmitry Trenin: No, I don’t. I mean that the differences between all sorts of nations are like the ones between all sorts of people; people do not see eye to eye, people have different interests, but that doesn’t preclude them from communicating and sometimes collaborating very closely together. I see little prospect for a new great game between the U.S. and Russia in, say, Central Asia, or Iran, or in the Pre-Caucasus. I see some discussion about battles by the protagonists of the archaic world order. But in reality, I think Russia is becoming increasingly focused on its own development; it is not about who controls Bishkek, it’s about what kind of power Russia has in the 21st century. It is about whether Russia will be able to develop its Far Eastern territories, it is about whether Russia will be able to hold its own vis-à-vis or other players, including China, a very big player, and I think Russia doesn’t have a very good long-term strategy in this regard. So you have all these things, and I might be optimistic, but I think that the US and Russia can have a pretty productive relationship; they are both interested in stability, they are both interested in ruining terrorism, radicalism, they are interested in non-proliferation, in presuming some kind of balance in different parts of Asia, that brings them together; I think this has been increasingly shared even between the people who are serving the two governments. Ekaterina Kudashkina: The time has come to turn to Red Line’s concluding heading, Man in the News. This week we are going to speak about a Lady in the News, to mark the centenary of International Women’s Day. Meet the woman in the news: Marine Le Pen, the new leader of France's far-right National Front, founded by her father Jean-Marie Le Pen in 1972. The results of the latest opinion polls, as revealed by the daily Le Parisien last Sunday, actually sent a shockwave over France, because Marine Le Pen would win a first-round presidential election victory in France if voting were held now. In an opinion survey, the 42-year-old Le Pen would receive 23 per cent of the vote, which would put her ahead of incumbent President Nicolas Sarkozy with only 21 percent. So, we could look into – how shall we put it - the enigma of Marine Le Pen. Mira Salganik: I’d add that the latest addition is a media-friendly blond charmer who obviously knows how to maneuver her popularity with media and her blond good looks. In general, she knows exactly what she wants to achieve. Ekaterina Kudashkina: So what is it that she wants? Mira Salganik: Let me quote: "Now it is my desire to carry on my father's fight," she says. "I want to strive for what he believed in, what the French people really want. And if I don't achieve it, then I don't think anyone else could succeed." Sergei Strokan: It seems that she inherited her father’s guts! In fact, Ms. Le Pen objects to the term "far right" usually attached to National Front, she is claiming that it marginalizes a group that regularly attracts about 15 percent of voters in national elections. And as we learned, polls suggest that National Front has already eroded President Sarkozy's support. A very recent survey shows that 32 percent of Mr. Sarkozy's voters are supportive of the National Front’s ideas – that is a 10 percent jump in one year! Mira Salganik: Coming back to the survey, published on the website of Le Parisien – it showed Marine Le Pen would win 23 percent of votes in the first round of elections, which usually consist of two rounds, versus 21 percent for the centre-right president. Just as a reminder: her father, Jean-Marie Le Pen shocked much of France when in 2002 he defeated the former prime-minister Lionel Jospin in the first round. He lost the final round to Jacques Chirac. Ekaterina Kudashkina: That’s right. Do you want me to tell you what her reaction to the poll results was? She said: "This poll makes me believe that Nicolas Sarkozy will lose this presidential election”. But Mira mentioned Jacques Chirac and my question to both of you is: don’t you find it rather symbolic that the news of Marine le Pen’s success coincided with the beginning of ex-president Chirac’s corruption trial? Sergei Strokan: Old stars are fading and new are rising. Yet, Marine le Pen is still perceived by the majority of French voters as the re-incarnation of the extreme right. It is a paradox: While most French people are still deeply suspicious of what Marine Le Pen stands for, her party is still gaining momentum. Ekaterina Kudashkina: Marine is actually seen as a women’s rights activist: She supports abortion rights, she has been divorced twice, and she has three kids. And some believe that she presents even a more serious threat to President Sarkozy than her father. In fact in one of his interviews Jean-Marie Le Pen said that Marine was "a different person", he said: "She is a woman, 40 years younger than me and in tune with the times." Mira Salganik: In tune with the times is the key component, to me at least. And in this economic gloom that prevails in France she is in an absolutely perfect climate to steal political ground. Sergei Strokan: Not only this, Mira. She looks like “the right person in the right time.” She emerges as a major political figure in France at the time when far-right forces are gaining momentum all over Europe. Ekaterina Kudashkina: Let me quote Nonna Mayer, an expert on far-right politics at the Sciences Po University. So that’s how she describes Marine Le Pen: "She has the same ideas about immigration as her father. She thinks there are two kinds of French people: the 'real French' and the others. But she packages this message in a different, softer way. She is very popular and very good with the media." Provided that Sarkozy’s rating is shaky, Marine Le Pen could be a very dangerous opponent. But I really doubt that in the next year elections she can win, even she makes it to the second round. Mira Salganik: I also think that France will not vote in a party like the National Front, but let us discuss it with those who know perhaps the French political scene better. Ekaterina Kudashkina: Now our guest speaker is Dr. Berny Sebe of the University of Birmingham, UK. Ekaterina Kudashkina: Dr. Sebe, how would you explain the reasons why Marine Le Pen, who was largely unknown to the wider public, has become so popular all of a sudden? Berny Sebe: Let me say as a preamble, as a starting point, that Marine Le Pen is not as unknown as we might have gathered from an appraisal on the international scene. It’s true that she’s been suffering from very poor visibility since she started as a politician in France, but actually, she’s been widely talked about in France for a while. Ekaterina Kudashkina: Could we perhaps take a little step back and look at the recent history? How do you see the sentiment regarding immigrants in France developing? Berny Sebe: At the moment that there seems to be a scare spreading among a significant section of the electorate in France, which doesn’t seem to find the current initiatives made by the French government satisfactory and therefore they want to go even one step further. So mostly, it is support out of fear of difference, fear of foreigners and this climate tends to become very propitious and favorable to far right candidate Marine Le Pen. In particular, because she has been making every effort in order to make her party – the party she’s been leading since January of this year – more acceptable and try to erase the stigma of being a far right party, which was unspeakable on the political scene. Ekaterina Kudashkina: And given the recent developments in the Middle East, the number of immigrants from that region is going to rise in France? Berny Sebe: Yes, one of the explanations of the good results that she got in the recent opinion polls might be found in concerns among the French population that the current events in North Africa and the Middle East might lead to an increase in the number of immigrants first of all reaching the Italian shores and then expanding into and resettling in France. Ekaterina Kudashkina: What is her program? What does she suggest, what needs to be done about this immigrant issue? Berny Sebe: Her program in general tends to be focusing on the limitation of migrants entering France. So she tries to be the applicator of a tougher line than the one that the government is following at the moment and that is the reason why she appeals to the electorate who is afraid of foreigners entering the country. So that is one of her selling points. Ekaterina Kudashkina: Do you think that perhaps the National Front is in for a victory in next year’s elections? Berny Sebe: I think it is beyond doubt that the National Front will be unable to win the presidential election in 2012. The question today is whether Marine Le Pen would be able to reach the second round of the election, because the French election system is based on two rounds. In the first round, the people who get the highest scores get into the second round, where they run against each other. And given that there is only one far right candidate, there is no possibility to end up with two far right candidates. The candidate who will not belong to the National Front will therefore mechanically get the votes of the traditional right and the left, and this candidate is bound to win the election. So I see it as very, very unlikely – I do not see how Marine Le Pen could manage to get 50 percent of the vote in order to win the second round of the election. So the best she can hope for is to get to the second round, but not to win the election itself – it seems beyond doubt that this is not possible, this is not in the equation. Ekaterina Kudashkina: What would that mean for her party? Berny Sebe: For her party, that might mean a significant increase in popularity, and she would be able to cash in more seats in the National Assembly when the general election takes place. So it could increase the position of her party on the political spectrum but I think it is definitely out of the question that she could reach the supreme sanction. It is just very surprising that she’s managed in such a short lapse of time to make her party more popular and more reputable than it has been in the past. But this is not a new policy – Marine Le Pen has always been campaigning from within the National Front in order to make it much more acceptable, to put an end to what she calls the process of the “diabolisation” of the party. But there is no risk in any case for democracy in France, because there is no way that she would be able to win the second round. But already reaching the second round is in itself a worrying trend.